This week, I’m breaking with my general rule to only publish original work on our blog. Sort of breaking. Below, we’ll make introductions, and then answer 10 questions from the question pool provided by the project. Note that our answers aren’t intended to be a “This is the way to do it” resource, but rather a “this is what we did and here’s how it worked” sharing. We’re Keith and Nicki, a carpenter and a fitness instructor/realtor in the summer, and cruisers in the winter. 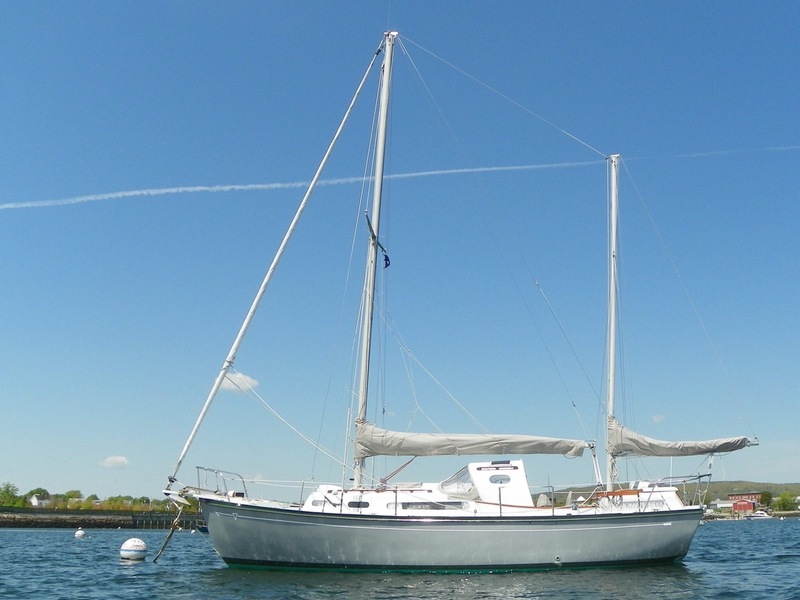 Aboard our Triangle 32 Sionna (a center-cockpit ketch built in 1963) we left Rockland Maine in August 2016 and headed south via the Atlantic ICW, Okeechobee Waterway and the Gulf of Florida to spend our first cruise of 8 1/2 months in warmer weather than Maine can offer. We are best described as “Commuter Cruisers”, a term I attribute to Jan Irons, who’s blog Commuter Cruiser was our constant source of information and inspiration during the planning stages of our transition back into the REAL world – the world of cruising aboard a simple, well-loved and well-built boat. As of this writing (July 2017) the boat is stored in Florida, and we’re back in Maine for the summer living in our 36′ RV (we sold all real estate in preparation for cruising), working for enough dollars to return to the boat next winter and continue our cruising, most likely to the Bahamas in 2018. We love to connect with other cruisers and particularly wanna-be cruisers, folks who think they want to go, or KNOW they NEED to go, but lack information. We don’t know it all, but we know some, and we know a lot of people who know a lot more. Contact us here on the blog, or email us at sionnaketch32@gmail.com. Expectations are the killer of more cruises than any other single thing. Your expectations, your partner’s expectations, even the expectations of the folks back home. All will be an additional layer of stress and discomfort and – if not recognized and addressed – are almost certain to build up and become unpleasant. Even more challenging is that most of those expectations are probably sub-conscious, so how do you address an expectation that you don’t know you have? Practice. Her size and (relative) simplicity. Sionna is 32′ on deck, 35′ overall. These days, she’s considered to be very small for a liveaboard boat. She also has fairly simple systems compared to the “average”. Pressure and hot (only in the galley and cockpit shower) water, yes, and basic refrigeration, but we haven’t tried to recreate a suburban house on the water. Our electrical loads are low, our entertainments are simple, and we spend a great deal of time together. She is all the space two adults who like each other need to live comfortably. We couldn’t afford to cruise if we had a larger vessel. Respect the enjoyment of others at least as much as your own. I’m thinking of two specifics – generators and drones. We all need to charge batteries sometimes, I get that. But if you need to run a generator for three hours twice a day, you’re simply using too much power, and yes, running your generator during those times when folks tend to be outside enjoying the scenery (dinner and sunset, for instance) DOES bother your anchorage neighbors and IS disrespectful to those around you. And drones? Nicki and I have been the victims of “drone intrusion” three times, one was an outright spying – the drone hovering 100′ over the cockpit. If you feel you must fly one, please be respectful both in where you fly it, and for how long. Downsized drastically. Over the three years we took to prepare, we sold our real estate, closed our business and reduced our work schedules. We let the lease on our rental house go, and downsized from two houses (totaling 3800 square feet) to a boat, an RV, and a 5′ x 10′ storage unit, for a grand total of 500 square feet. 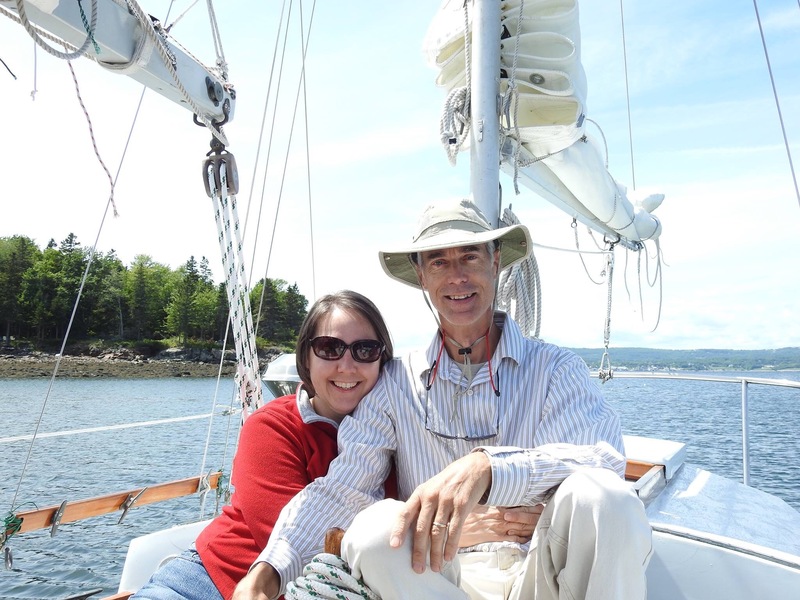 We sent 6000 pounds of “stuff” to the dump, untold trips to Goodwill, sold what we could… We borrowed from our retirement accounts to buy the boat – and bought a boat we could afford for $23,000. We’re not retired, but do have a small pension income to supplement our summer work ashore – thus our “Commuter” style of cruising. Basic boater ignorance. 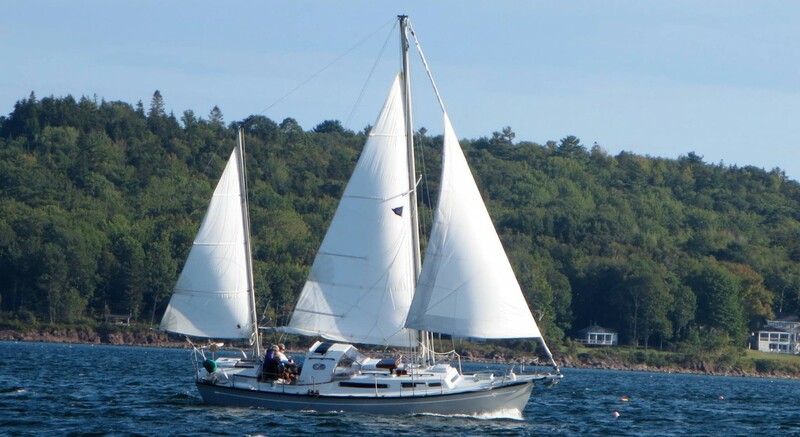 Nicki and I studied for years, learning everything we could about sailing and operating a cruising vessel in a safe, comfortable and efficient manner, and we still learn something new, every day. I was shocked and disappointed to discover how many boaters are out there with little knowledge and few skills, endangering both themselves and us in their fumbling. Partly I’m sure this is because we cruised in very populated areas, places that are easy to get to. As we cruise the Bahamas next season, we hope to move beyond the reach of the day-trippers and credit-card captains, and I remain optimistic that the issues we saw are unique to the ICW and Florida’s boaters. There’s a cruiser saying that “The most dangerous thing on a cruising boat is a schedule”, and we can attest that it’s true. Schedules cause stress. Schedules make you push the limits. They cause equipment breakage and injuries. And frankly, when you promise to be in “XYZ City” at a certain time, all the spontaneity and freedom you may have hoped would be yours in cruising goes right out the hatch. You’re back to expectations again, and it’s not fun. We still let ourselves fall into the trap now and then, but we’re getting better at refusing to be bound by “Type-A” personality behavior. Expect us when you see us, and not before. Is there a place you visited that you wish you could have stayed longer? More solar panels. We installed just one 100 watt panel, thinking that would mostly handle the refrigerator, which was the most power-hungry thing we’d added to the boat. Well it did, except for the months of December, January & February, when the angle of the sun was simply too low for sufficient charging. We’ll be adding another 120 watts this fall before we head out to the Bahamas, and hope that’s enough to make running the engine “just to charge the batteries” a thing of the past. Entering Manasquan Inlet to the NJICW. (See The Thing About Inlets on our blog) We had heard that inlets could be challenging with the combination of fast current opposing wind. We didn’t understand that “challenging” – in this case – is a boating euphemism for “You think you’re going to die”. We timed our passage to arrive at the inlet at slack current, but the sailing conditions were much better than forecast, and we arrived in choppy, uncomfortable sea conditions over 2 hours early. We thought “How bad can it be?”, and rather than standing off for two hours to wait for slack, we pressed on – and barely kept control of the boat. We now understand that “challenging” is relative – it can be worse than you can imagine. Most likely you’ve all heard the phrase “Learning the ropes” – meaning someone is new in a task or job, and is learning how everything works and where everything goes. But possibly many of you don’t know the origin of that saying. Like so many, it’s origin is nautical. Naturally the larger and the more complex the vessel, the more lines she’ll have, both to hold everything up and together, and to control the rig, sails, ground tackle, etc. How many?A veritable forest! 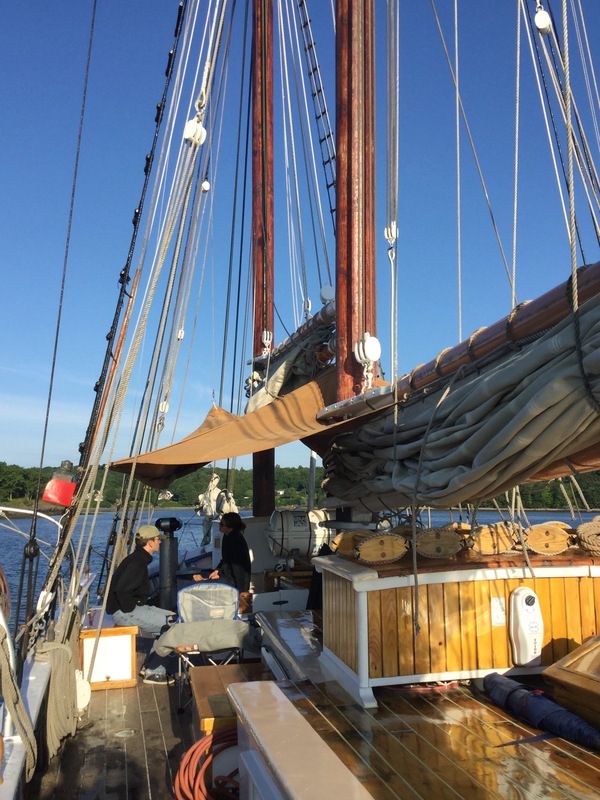 Now the interesting thing about a traditionally rigged schooner like the Isaac H. Evans (on which vessel Nicki and I are serving as relief crew this summer) is that there’s a line for darn near everything you can imagine. 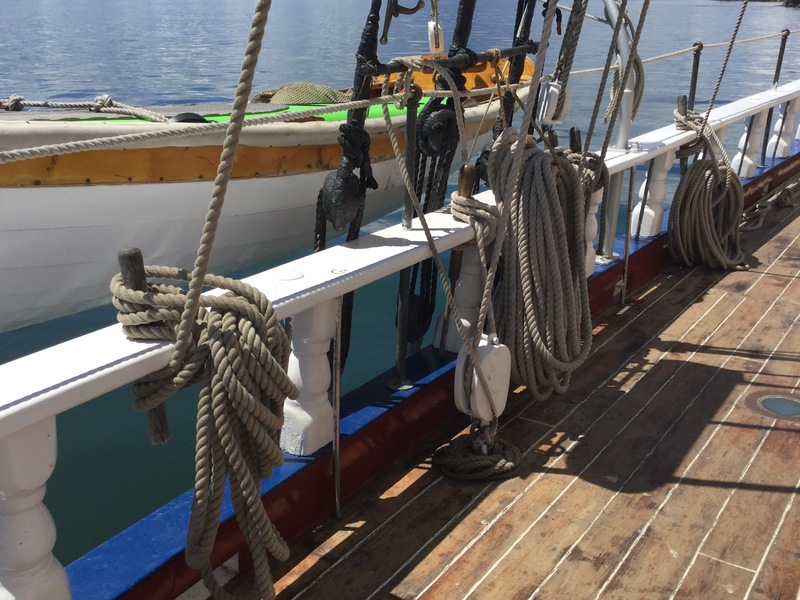 Because of her age, (she was built in 1886) there are very few cables, (called “wire rope” in sailing boats). My mental inventory counts just 22 of them, but a mind-boggling plethora of lines to hold everything together and make it move. I’m not going to try to count – trust me, there are hundreds. to port as we’re sailing with the wind on the starboard (right) side of the boat. The shrouds themselves are wire, everything else is wood or line. The first line (left in this photo) is the centerboard line, made off on it’s pin. The next back is the Mains’l peak halyard, the Mains’l lazyjack, another I’m not sure of (I’m still learning the ropes! ), and farthest aft, the “Bit”. Still with me? I hope so, because there are four stations like this on the Evans (being a two-masted schooner), they all look this complicated, and NOTHING IS LABELED! Well, almost. 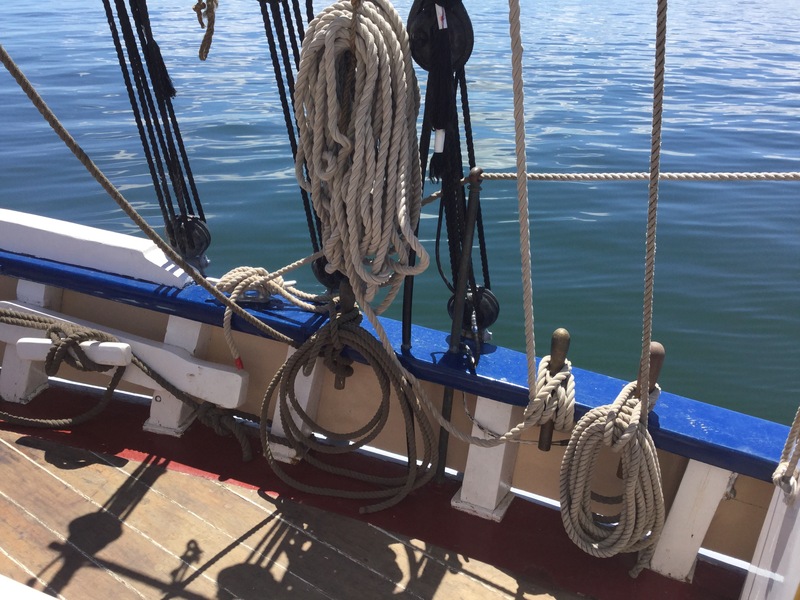 I was into my 8th day working aboard when I suddenly realized that the halyards for the main, fores’l and main-tops’l are always made off to pins that are made of bronze. And those are the only bronze pins on the boat. A light came on! Though the light isn’t great in this picture of the port foremast rail, you can about make out that the far-left (aft) pin is dark wood, the one next to it (with darker line attached) is bronze, the next is reddish wood (I’m guessing red oak? ), and the one after that is stained dark – perhaps white oak? I’m starting to see a pattern. Oh, and all those lines? Here’s my test! 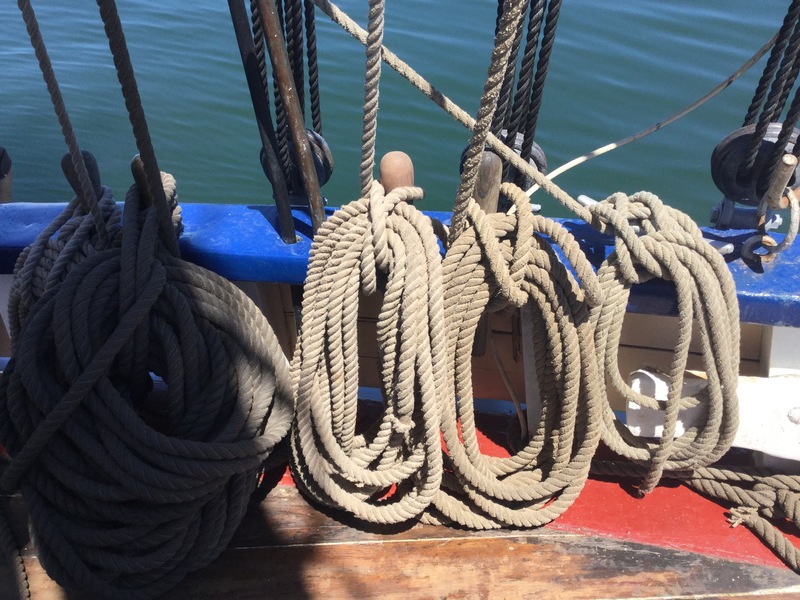 Left to right, they are: I don’t know yet; Foremast peak halyard; Stays’l halyard; Bailey; and finally port lifeline (on the cleat). That large line lying on deck to the far right of the photo is the port jib sheet. The reward for all this new knowledge is, of course, the chance to be part of the team that makes her go and keeps her sound. 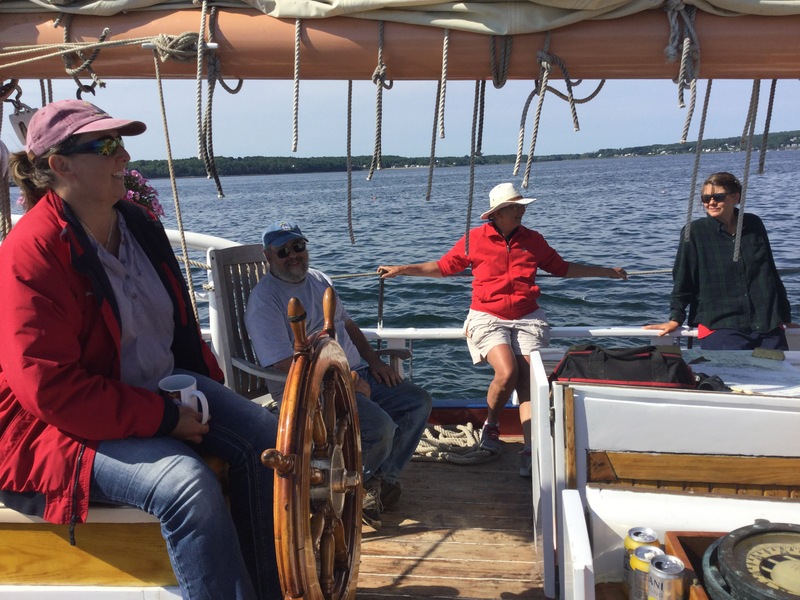 That’s owner and Captain Brenda “Cappy” Thomas at the wheel, former owner and fix-it man extraordinaire Captain Ed Glaser, accomplished sailor and friend Meriel, and First Mate of the highest order, Autumn Simpson, here relaxing under sail after what was – honestly, a bit of a tense morning, equipment-wise.